DPlot is a Windows program that lets engineers create presentation-quality graphs from a wide variety of data sources. Whether you're an aerospace engineer, a biomedical engineer, a civil engineer, or an electrical engineer, you'll benefit from DPlot's powerful graphing capabilities. A few decades ago, hand-drawn graphs on the blackboard were sufficiently compelling to fellow engineers. Today's engineers, however, are used to seeing presentation-quality graphics in every medium, from cereal boxes to local TV news. Engineers need more sophistication in the laboratory and workroom to keep their stakeholders' attention. 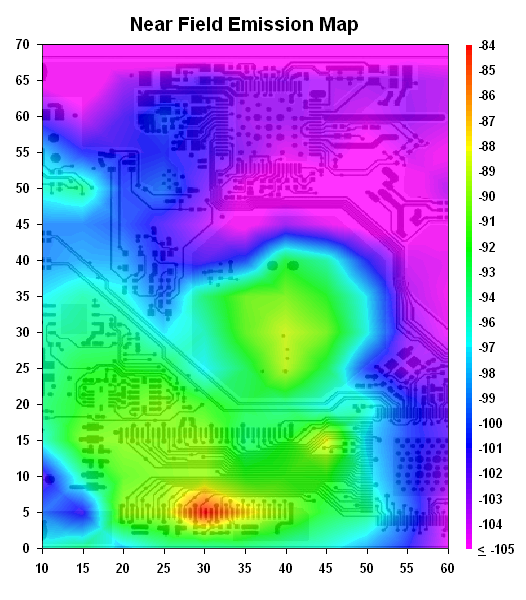 DPlot gives engineers the highest quality, most accurate graphs that are available on the Windows PC today. And by using captivating graphics in your presentations and other work products, you can keep colleagues and managers interested in your work. DPlot turns team members into supporters. With DPlot, engineers can utilize data files from a wide variety of sources, and turn them into graphs of all types. DPlot easily lays out the graphs the way engineers need them, and labels and annotates them. For added emphasis, it's easy to use photos or images as the background for your graphs. DPlot lets engineers graph and manipulate 1-, 2-, 3-, and 4-dimensional data. If you have a spreadsheet file or an ordinary comma-delimited file that contains statistics by year, or any groupings of figures, DPlot can grab the data, and lay it out for you in a huge variety of graphic representations. The Excel add-in makes it simple for engineers to move data in a variety of layouts from Microsoft Excel to DPlot. DPlot lets you display presentation-quality graphs in a number of graph types that are simply not available in Excel, including polar charts, triangle plots, Mercator projections, grain size distributions, and N1.85 hydraulic scales. These graphs support the work of mechanical engineers, nuclear engineers, and professionals in every engineering specialty. Some of your colleagues and stakeholders learn well from your verbal presentations. Others can grasp engineering and technical data more quickly if they see it displayed graphically. DPlot lets engineers to turn data into graphics, effortlessly. Sometimes engineers need to create stunning contour plots of 3- and 4-dimensional data. Other times, a bare-bones chart can tell your story much more effectively than words. DPlot can meet all of your engineering graphing needs. If you're working on mechanical engineering projects, environmental engineering tasks, or any science or engineering tasks, DPlot can help you illustrate specific functions and formulas effectively. DPlot can enhance your proposals, journal articles, status reports, and project summaries. Colleagues and management are not your only target audiences. Your engineering work will be examined by stakeholders as diverse as government regulators, potential investors in your company, and journalists who can help you educate the public. Impress all of your stakeholders by delivering numerical information clearly, graphically. Whether you're preparing engineering material for your coworkers, illustrating proposals for grants, preparing your calendar-year budget for your manager, or illustrating a journal article, DPlot can help you create stronger visual images. A single-user DPlot license costs $195(US), and will improve all of your engineering graphs and charts now, and for years to come. 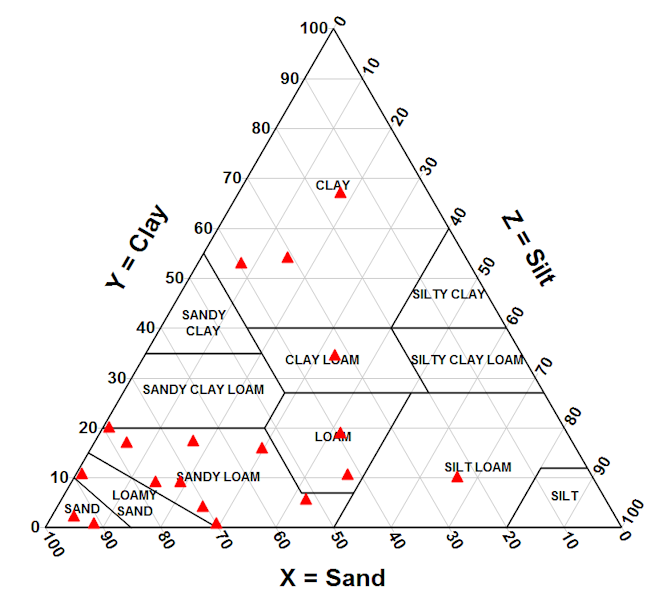 Triangle plot, often used in geologic studies. See the Triangle Plot page for more information. DPlot also includes support for IUGS mafic and ultramafic rock classifications as well as Ab-An-Or mineral classifications. 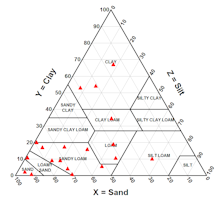 In general it is a relatively simple process to add boundaries and labels for any other common ternary plot. But of course if you have a classification not supported by DPlot you are welcome to let us know, and we'll likely be able to add that plot-type in short order. To create a triangle plot, import or enter your data to initially create an XY plot with linear scales on the X and Y axes. Then simply right-click on the plot and select "Triangle Plot". For more information on triangle plots see the Triangle Plot page. A grain size distribution plot is a special purpose graph generally used to depict the results of a sieve analysis, commonly known as a "gradation test". The sieve analysis determines the gradation (the distribution of aggregate particles, by size, within a given sample) in order to determine compliance with design, production control requirements, and verification specifications. Grain Size Distribution Plot, US Standard Sieves. 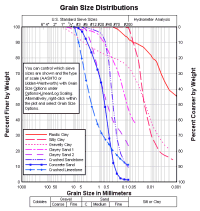 For more information see the Grain Size Distributions page. 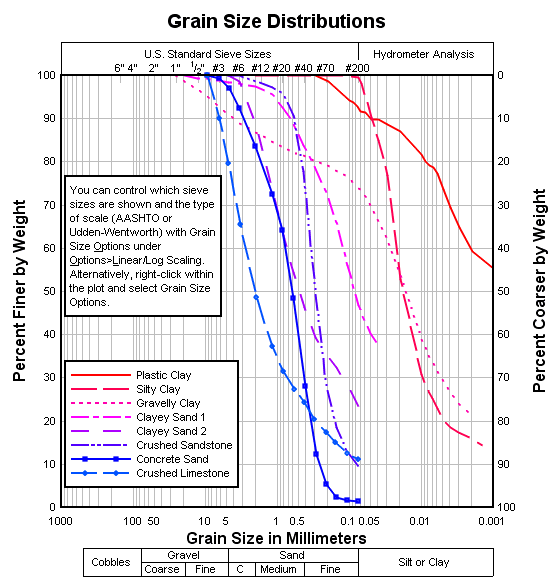 The graph above shows grain sizes in millimeters, AASHTO material classifications below the X axis, and AASHTO-standard sieve sizes above the graph. You can control the grain size units, choose the Udden-Wentworth scale for material classifications, and/or pick British standard sieve sizes for the top scale. For more information see the Grain Size Distribution page. For a more complete list of DPlot features see the Features page. I am editor/publisher of Linear Audio and often authors provide graphic plots that are really awful and I have to find a way to make them print-ready & presentable. That was why I was searching for a program like DPlot. I installed DPlot including the Excel Add-In and have used it to plot a 128k point FFT which came alive with just one click! Awesome, possibly the best s/w purchase I ever made! Thanks for providing a great product!